It can only mean one thing when that Hotline Bling -- more good news for Drake. The Canadian rapper has become the first artist to have an album, in this case the April-released "Views", register over 1 billion streams. 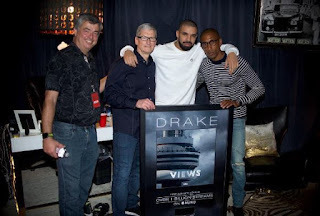 Earlier this week, he received a plaque from Apple CEO Tim Cook, iTunes boss Eddy Cue and Apple Music head of content Larry Jackson, as seen on his Instagram account. It didn't just crawl over the mark, either. Jackson on Tuesday noted via tweet that the album was now up to 1.5 billion streams on Apple Music. "Views" is something of a feather in Apple's cap, having secured 5 days of exclusivity on Apple Music back in April. The streaming service, which competes with Spotify and Tidal, will also host an exclusive "visual companion" to "Views", it was announced in a tweet. The album isn't just a digital juggernaut, it's also topped the US' Billboard 200 charts for 13 non-consecutive weeks. 0 on: "Drake's 'View' is the first album to hit 1 billion Apple Music streams "